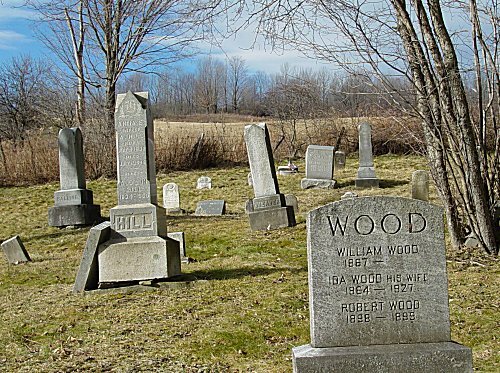 The Sagetown Cemetery is situated in the Town of Southport, Chemund County, New York, in the extreme southwest portion of the county and only one half mile form the Steuben County line. It is located on the west side of County Road 36, (Dutch Hill Road) and is one tenth of a mile from that road’s termination with New York State Highway 225, the latter running east and west. The burial ground is located on a rise of ground about 50 feet from the road and is approximately 200 feet by 175 feet in size. The tombstones are widely spaced, indicating there may be numerous unmarked graves. Flower vases and crocks indicate grave locations, as do depressions in the ground. One vase sets infront of a clump of sawed stumps of an aged bush, but there is no tombstone. Some tombstones bear only the words “Father” or “Mother” but no data concerning whose graves they mark. Some shaft type monuments have been tipped from their bases and lay on the ground. One badly eroded white tombstone leans against the trunk of a small tree and could not be read except for the following; _____, Ella C. died October ___, 1861. Another marker lays face down in a clump of bushes and cannot be lifted to be read. The southwest corner of the burial ground is covered with very thick brush and weeds, dead and decayed wood, leaves and grass. The responsibility of caring for the cemetery rests with the highway department of the Town of Southport. There is a large field stone tombstone with no data lying on the ground in the extreme southwest corner of the cemetery. A small American Flag was stuck in the ground next to it. The following data was copied by Joseph C. and Doris Boyd on September 15, 1973, with some data from a Kinner Record. In the cases of some wives, sons, and/or daugthers, the surname has been added for clarity. Balling Sarah 9/3/1818 2/15/1892 wife of John C.
Bois Pattai Ackerman 1836 1901 wife of Harmon H.
Racklyeft JNO. Company F, Infantry New York L.A.
Wood Howard 7/7/1928 Private, NY 155th Depot Brig.